All-in-one tool to grow your business. This unique all-in-one tool manages your customer relations (CRM), invoices, tasks, appointments, payment reminders and helps you to close more deals. Make it fit your business. 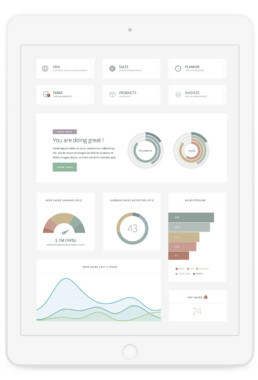 Personalise every dashboard, chart, database, field, table, donut, .. Designed for maximum ease of use with a minimum of distraction. Link your e-mail, contacts & appointments to see the bigger picture. Convertible connects with the list of services below. We concepted and created a simple app with very extensive customer management (CRM) to help you find any contact from the past (such as e-mails, phones & appointments) but where you also can add documents, questionnaires and tags. Next to that you can also add deals to a customer and our app will send you follow-up reminders to increase your sales. If a sale has been made, it can be converted to an invoice and the system will automatically send payment reminders if necessary. Best software👌 that our stores have already used to manage reservations and customer cards. Receive news and early bird promotions.